Another fun treatment Bee and I decided to do was an at home hot oil hair treatment. I found this idea for this while googling how to make my hair grow faster. Apparently, regular hot oil treatments increase the speed of hair growth as well as making it shiny and healthy. The supplies needed are only Olive Oil and Honey. 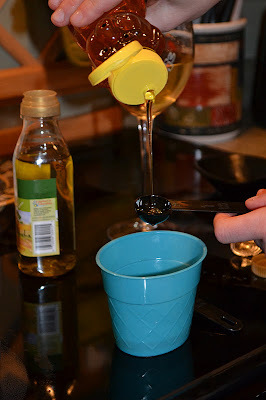 First step is to add 3 teaspoons of olive oil to 1 teaspoon of honey. We didn't think this was enough for both of us. So we doubled the recipe. Then we thought that still wasn't enough so we doubled it again. Next heat the mixture until it boils. After it boils, take the mixture off the heat until it cools. Although the instructions don't specify, I found other instructions for hot oil treatments that requires the hair to be damp. So Bee dampened my hair in her kitchen sink. Next comb the oil mixture throughout your hair. Wrap your hair in a shower cap or towel for 30 minutes. Now it's Bee's turn. Of course as I was in charge of watching the mixture boil, I let it burn. Classic Smash move. But we decided to do it anyway, and just avoid the burnt portion. I drizzled the oil throughout her hair, Still smelled great. This is what happens when burnt honey solidifies in your pan. It was creepy and weird. After I washed the oil out of my hair and dried it felt great. It felt really smooth. I would recommend shampooing twice just to make sure there is no oil left. Yay! Shiny hair! Why don't I look happier about it? I really was happy. I promise. I don't have any after photos of Bee's hair because we were going out to dinner, we were hungry and forgot. Hunger makes your brain act silly. Her hair looked incredible! It was shiny and smooth and even a little straighter than normal. I would definitely recommend this to anyone who wants shiny hair. Just beware of the nugget cravings that come along.